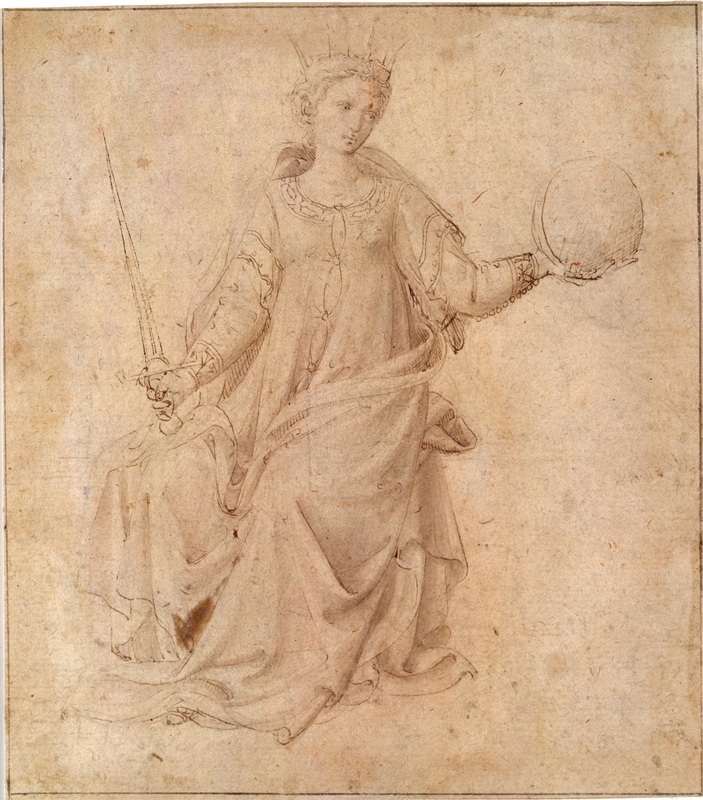 This drawing, typical of the studies of seated Virtues that appear in medieval and Early Renaissance model books, portrays the allegorical figure of Justice, wearing a crown and holding two of her traditional attributes: a sword, symbolic of her power, and a globe, emblematic of her universal authority. Framing the composition is a finely drawn black line, described by Collobi-Ragghianti as a remnant of the kind of surround applied by Vasari to the drawings in his famous Libro de' disegni. (*1) On the verso of the sheet are hastily executed sketches showing a baby in swaddling clothes being supported by a hand and, above, portions of unidentified architectural structures. Бумага, перо и коричневые чернила, кисть и коричневая акварель, бумага. First published by Berenson as the work of an anonymous follower ofAngelico, the Lehman Justice was subsequently catalogued by Degenhart and Schmitt as "Florentine around 1500," and attributed by others to Pesellino and Domenico di Michelino. In the recent catalogue of drawings in the Lehman Collection,(*2) Anna Forlani Tempesti acknowledged the semitive handling and monumental quality of the figure's pose and draperies, which she compared to works unanimously attributed to Angelico, such as the British Museum King David Playing a Psaltery (cat. 26). At the same time, Forlani Tempesti considered the soft modeling of the figure inconsistent with the artist's vision and, returning to Berenson's original assessment, she ascribed the study to a follower of Angelico and dated it about 1440. Since then, the only author to discuss this drawing in direct relationship to Fra Angelico has been John Spike,(*3) who lists it as "possibly" an autograph work, perhaps related to the (lost) frescoes painted by the artist in Rome between 1446 and 1449. 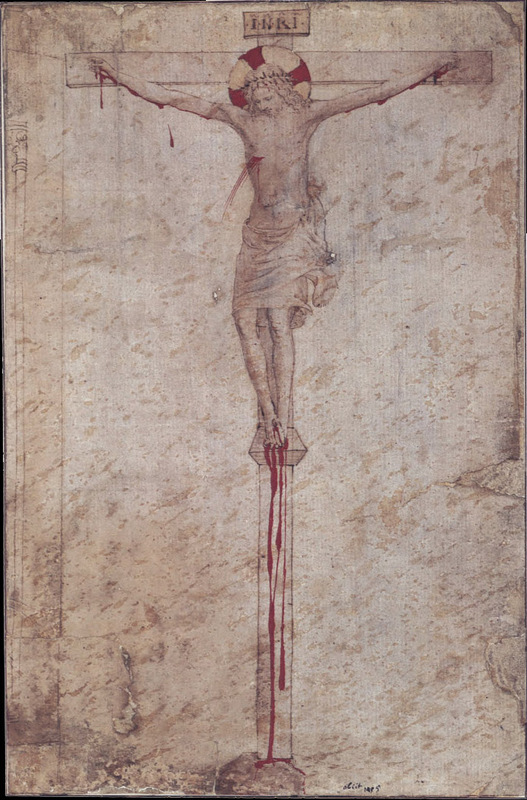 An important factor in debating Angelico's authorship of the Lehman Justice is the close similarity in both its paper support and its technique to the Albertina Christ on the Cross (cat. 22), possibly excised from the same model book and ascribed to the artist by most scholars. Бумага, перо и коричневые чернила, красная акварель, бумага. Although in some parts less finished than the sheet in the Albertina, the present drawing is distinguished by the same delicate lines and subtle effects of light and shadow that gently model the figure's forms while also articulating the deeply cut, sculptural folds of her voluminous draperies. Equally comparable to the Christ on the Cross is the meticulous attention to naturalistic details that heighten the visual impact of the image, from the minutely described physiognomy of Justice, to the realistically observed puckering and pull of the cloth around the fastened buttons of her dress. 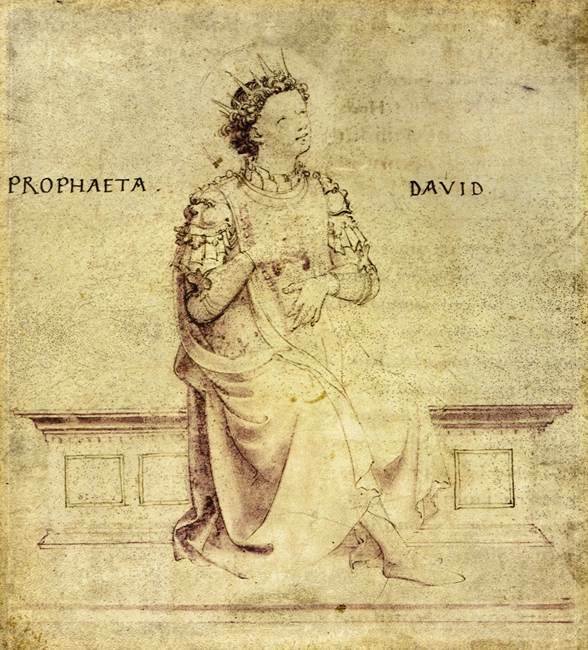 Emblematic of Angelico's throughly rational approach is the confidently rendered foreshortening of Justice's crown, which is no less competently realized than the crown worn by the British Museum David. Finally, the precious quality that distinguished the Albertina drawing is also evident here — most noticeably in the fussy definition of the intricate geometric patterns and the tiny row of pearls that decorate the sleeves and neckline of Justice's elegant, courtly attire. Perhaps the most compelling evidence for the attribution of the Lehman Justice, however, is its stylistic and formal relationship to Angelico's paintings from the second half of the 1420s. 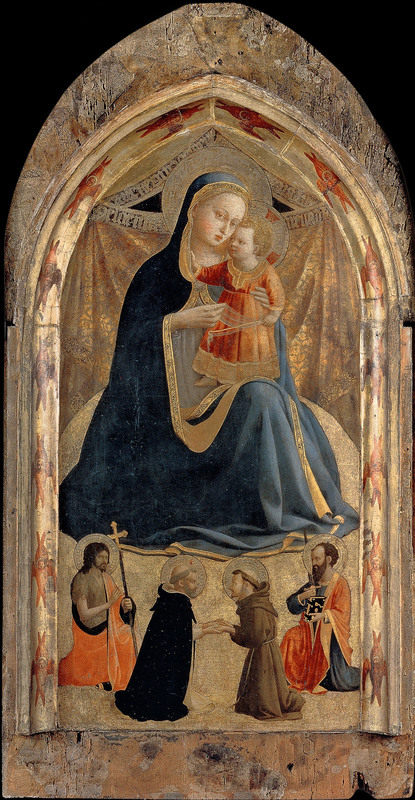 These works have been generally viewed as reflecting the artist's receptivity during this period to the graceful, Late Gothic monumental idiom of Gentile da Fabriano, as much as to the more austere, classical vocabulary of Masaccio.The most pertinent comparison for the drawing is the Madonna of Humility (cat. 21 A) in the Galleria Nazionale, Parma, datable to about 1427-28, which is so strongly reminiscent of the Lehman Justice in theVirgin's physiognomy and the soft modeling of her head and facial features as to suggest a virtually contemporary date for the present study. Common to both drawing and painting is the harmonious juxtaposition — ultimately derived from Gentile's example — of the solid, sculpturally conceived figures and draperies with a refined decorative sensibility and consummate delicacy of execution. (*1). Collobi-Ragghianti 1974, vol. II, p. 78. (*2). Forlani Tempesti 1991, no. 64, pp. 178-81 (with earlier bibliography). (*3). Spike 1996, p. 257.